Ferns are magnificent, whether in the wild or under cultivation. Among the oldest plants on earth, ferns can be traced back to the Coal Age, over 300 million years ago. Today, ferns are one of the most overlooked and under-utilized perennials in the garden. Eastern North American native ferns are available in a vast array of sizes, forms and textures and thrive in a variety of habitats. Many ferns present a combination of both fertile (with spores) and infertile (without spores) fronds that add an additional element of interest to their growth and texture. Some ferns prefer sun, some shade. Some prefer moist soil, some dry. Some spread quickly, some stay put. Some are easy to grow, some… not so much. You get the picture – the versatility of this plant group ensures a selection for every gardener and every garden situation. With so many ferns to choose from, which is right for your landscaping needs? Consider the following popular varieties, or come in to consult with our landscaping experts to find the perfect fern to complement your landscape. Cinnamon Fern (Osmunda cinnamomea) – Grows 24-36 inches tall. The stiff fertile fronds appear in spring, first green and later turning cinnamon-brown. The plant grows neatly in a symmetrical clump. This fern does best in a shady site with moist soil. Christmas Fern (Polystichum acrostichoides) – This is one of the few evergreen ferns native to the eastern United States. The leathery fronds of this durable fern reach 18 inches in height. The Christmas fern is not an aggressive spreader and is easy to nurture in a moist, shady garden. Hay-Scented Fern (Dennstaedtia punctilobula) – This lovely fern grows to about two feet in height and spreads rapidly. Spreading may be controlled by pulling out some of the growth in spring. This fern does best in full sun to partial shade and will tolerate somewhat hot, dry sites. 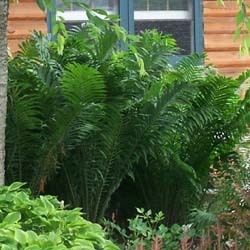 Hay-scented fern produces lightly scented, apple-green, lacy fronds that add delicacy to the garden. Interrupted Fern (Osmunda claytoniana) – This fern is unusual for its sterile, three-foot tall fronds that have brown spore cases in the middle of the frond with pale green leaflets both above and below. Interrupted fern grows best in a shady site with moist soil. This fern will tolerate more light and drier soil than most, and it is remarkably easy to grow. Lady Fern (Athyrium filix-femina) – This fern can reach up to 36 inches, although its height can be quite variable. This easy-to-grow fern is an excellent choice for beginners. In the spring, Lady ferns produce a hearty flush of reddish-green growth. This is when the plant is most beautiful. Lady fern does best in shady conditions with slightly acid, moist to wet soil. Maidenhair Fern (Adiantum pedatum) – At 18 inches tall, this specimen is the daintiest of the Eastern North American native ferns. The fan-like leaves are borne on delicate, curving, black stems. This fern does best in filtered light and well-drained, cool soil. This fern spreads fairly slowly. Ostrich Fern (Matteuccia struthiopteris) – This fern produces light-green, gracefully arching fronds that reach up to 40 inches or more. This is an excellent choice for background planting. Underground runners extend in all directions and will colonize large areas, so it needs abundant space. The early spring fiddleheads are edible. Ostrich fern does best in sun to partial shade and moist soil. It is native to marshy areas. Royal Fern (Osmunda regalis) – This fern forms a three-foot, vase-shaped clump of bright green fronds. Light brown spores are borne on the top of the fertile fronds. 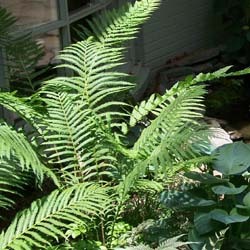 Royal fern does best in shade or sun and a moist organic soil. Sensitive Fern (Onoclea sensibilis) – This fern makes a spectacular ground cover of 18 inch high, light green fronds. The fronds emerge in the spring tinged pinkish-purple until maturity. This fern prefers average moisture and part sun.